Everyone feels very embarrassing when they find himself in the mirror with pimples and acne. Pimple is kind of spot, blackheads or wound cause by excess oil in the skin pores; many kinds of pimples have founded in medical research and they are caused by excessive production of sebum by sebaceous glands in our body. If the skin cells or pores are dead then the condition of blockage of sebum on that particular pore; it may be a critical or initial condition for acne and pimples. When pores are blocked then sebum comes out from another places or pores in excessive amount and the skin cells became a pimple spot. It is the result of the intractable food. It might be a parental disease. Excessive intake of heat producing food and drinks. You can either go for a doctor to consulting and taking medicine as prescribe or try to use some Ayurvedic and natural homemade remedies to get rid from pimples at home. Here are some effective home remedies for it. Lemon is the best remedy to treat pimples quickly as possible; it is a rich source of vitamin C that works as natural remover of pimples. Take juice of a lemon (It should be fresh) and apply on your pimples or on affect area with cotton ball. leave it overnight and wash it with clean water in the next morning. Note: Don't use it if your skin is sensitive. Take some dried orange skins and make a fine powder by grinding them. Then add equal amount of gram-flour into this powder and mix well. Put this mixture into water (Only add as needed or Sufficient water that make a paste) for 15 minutes. Now apply this paste on your pimples and wash it with lukewarm water after ten minutes of applying. You should use this treatment on regular basis for at least four to six weeks to permanently get rid from pimples and scars. Garlic is the best kitchen ingredient; It has anti-bacterial, antiseptic and anti fungal properties that help to treat acne and pimples. Extract the juice from a fresh garlic and therein add a few drops of water. Apply it on the affected area with cotton ball to get rid of pimples and acne. or Take 2-3 fresh garlic cloves and cut them into slices, eat (chew) them with water in the morning on an empty stomach to get rid from pimples and acne. Salt-water has natural antiseptic and antibacterial agent that helps to remove any bacterial infections and swelling agent. Wash you face with salt water every day before go to sleep; you will gets a glowing skin with this treatment. Sandalwood has an antiseptic and antimicrobial. Due to this antimicrobial activity, it can be used to clear skin from blackheads and acne. Take a sandalwood stick and make the paste by rubbing sandalwood stick with rose water on a rough surface. Apply this paste on your pimples or on affected area before go to bed. Leave it overnight and wash with clean water in the next morning. 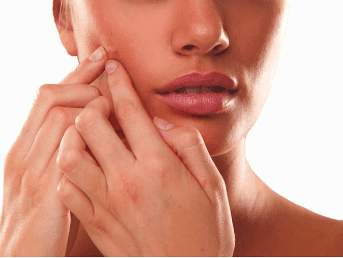 You will defiantly get rid from dark spot and pimples with this remedy. Apple cider vinegar is a natural antiseptic and antibacterial agent that performing very well to cure pimples and other skin disorder with. Apply 2-3 drops of apple cider vinegar with cotton ball on affected area or pimple, Leave it for 2 hours and then wash it with clean water. Aloe Vera has anti-inflammatory, antiseptic and anti-bacterial properties that helps to reduce swelling and irritation of skin. Use Aloe-Vera gel on the affected area to get rid of pimples and acne. Try to use a fresh Aloe-Vera gel that extracted from a fresh leaf to get rid from pimples quickly. Basil leaves works as skin cleaning agent and helps to make it fairness; Take some fresh basil leaves and wash them; extract its liquid by crushing or grinding. Apply this liquid on affected area with cotton ball. leave it alt least for an hour and then wash it with clean water. Don’t scratch and scrape the pimples. Take regular treatment for constipation, it's one of the main reasons for pimples. Eat healthy and balancing diet. Avoid salty, fried, junk and fast food. Drink more water to stay hydrate.